‌Home to some 350 million people, West Africa is one of the last regions to undergo a demographic transition, and the challenges to keep pace and satisfy the needs of a rapidly growing population are enormous. However, over the past 30 years the region's agricultural production has grown much faster than its population. The region's dependence on food imports has not increased. As a result, the prevalence of undernourishment has fallen sharply. Nevertheless, about ten percent of the population still suffers from chronic undernourishment or malnutrition. Ensuring the smooth running of markets, increasing investment in food production, and improving the living conditions of vulnerable households and their access to basic services (health, education, water sanitation and hygiene) are some of today’s key challenges for sustainable food and nutrition security. Under the political and technical leadership of ECOWAS, UEMOA and CILSS, the region has developed an ambitious agricultural and food security agenda: West Africa’s “Zero Hunger” goal, ECOWAS Common Agricultural Policy, UEMOA ten-year Community Programme on Agriculture, national and regional agricultural investment programmes (NAIPs, PRIA), etc. The Food Crisis Prevention Network (RPCA) is a unique platform and the SWAC is proud to be one of its pillars. The Network leads the Global Alliance for Resilience - Sahel and West Africa (AGIR), an outstanding example of international solidarity. ‌The Sahel famines of 1973 and 1984 are still etched in the memory of many, as the entire world discovered the disastrous consequences of these terrible droughts. Since then, Sahelian and West African countries have progressed in protecting themselves from the consequences of such catastrophes. Since 1990, the prevalence of undernourishment has decreased by 44% regionally, although unevenly across countries. 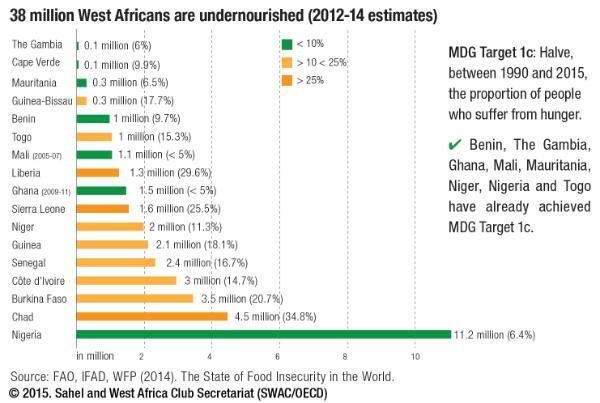 According to 2012-14 estimates, some 38 million West Africans are still undernourished and several million people face an emergency food situation every year, in particular during the lean season. Food security remains therefore a key challenge for the entire West African region. Eight West African countries have already achieved the MDG target 1c to cut in half the number of people suffering from hunger. ‌‌The region has made immense progress in the field of food crisis prevention and management. Today, it might be the best prepared African region to respond to and mitigate the impact of food crises. 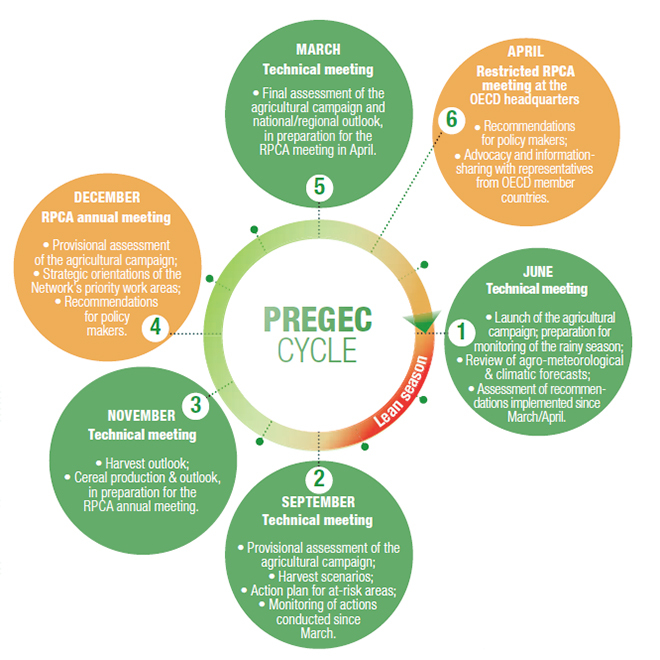 Pioneering regional co-operation in Africa, it is endowed with a consultation and co-ordination framework adopted in 1984 (RPCA), and a regional system for the prevention and management of crises (PREGEC). Using the analytical tools of the Harmonised Framework, the Network closely monitors the food and nutrition situation and identifies vulnerable households and areas that require particular assistance (> maps of the food and nutrition situation). 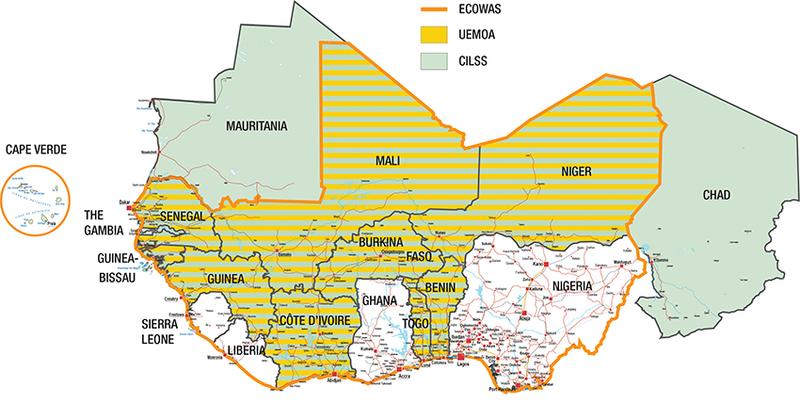 Information is then fed into the regional decision-making bodies of ECOWAS and UEMOA, as well as country-specific bodies that are in charge of setting up national response plans. The United Nations prepares its humanitarian appeals on the basis of the results of the Network's Harmonised Framework analysis. ‌Between 1980 and 2010, growth in agricultural production averaged 3.7%. 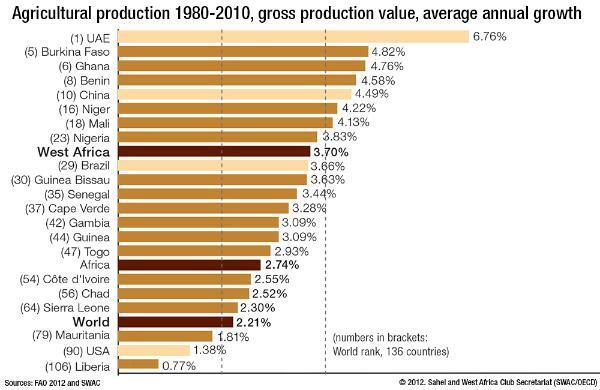 Over the same period, total production tripled and per-capita food production increased by 1.8% per year. Production of cereals has grown even faster: Nine West African countries are in the world's top 20, and the region's average annual growth rate of 3.8% easily exceeds that of Brazil (2.4%) and China (1.7%). Looking forward and based on current performance levels, a threefold increase in agricultural production appears feasible. According to the SWAC study on Settlement, Market and Food Security, this production increase will stem from an increase in the area cultivated (1.3% annually) and significant improvements in yields (1.7% annually).